Should auld acquaintance be forgot, And auld lang syne. For auld lang syne, my jo, For auld lang syne. And surely ye'll be your pint-stowp! And surely I'll be mine! And we'll tak a cup o' kindness yet, For auld lang syne. Yes, it is that time of year! New Year’s has arrived. Ushered in by the famous Scottish tune written by Robert Burns. His song written in 1788, always warms my heart as I remember friendships, past and present. But with the new year comes that dreaded word: resolution. According to dictionary.com, a resolution is a decision or determination; a firmness of purpose. Who wouldn’t want to start the new year off with a bang by writing down every firm decision they are determined to keep this year. But when you look at research only half of the people who write resolutions actually keep them. The average life span of a resolution is two to three months. What are some of the most popular resolutions going into 2019? The top resolutions are exercise, lose weight, get organized, save money, spend less money, or spend more time with family and friends. Why do resolutions have a short shelf life? Are the dreams of a perfect life too lofty? Too difficult to maintain? Not really something a person wants? 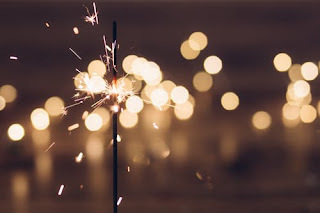 I wonder if resolutions fail because they are too vague, which is why I made a resolution to get SMART in 2019. SMART goals help you accomplish tasks by making them more manageable. It chunks long-term goals into smaller ones. What do I want to accomplish in 2019? Sound simple enough? Let’s try it. Desired Accomplishment: Write a book. SMART Goal: I want to complete my manuscript by the end of 2019, by writing one chapter per month of 6,000 words by setting aside two hours every Tuesday or Wednesday to focus on writing. Now, I am not a full-time writer. I have a day job and would like to keep it, so I have to think of what is realistic. Even if it takes a little longer than I would like. As a planner, I am aware that life happens. Which is why I give myself a choice either a Tuesday or a Wednesday. That way I can plan according to life plans. Desired Accomplishment: Learn more about the craft of writing. SMART Goal: I want to develop my craft of writing by setting aside one hour each Wednesday or Thursday to listen to a podcast or read a book about the craft of writing. I could include a podcast or book list, so I don’t waste time looking for the perfect one. Instead of having book lists buried inside of conference notes, I have a quick and easily accessible one right at the bottom of my SMART goal. Now, writing SMART goals are easy, but don’t forget accountability to make sure you accomplish them. Finally, remember SMART goals are not set in stone for life. Review them often. It can be weekly, monthly, or quarterly. Figure out what works best for you. Let’s strive to be in the group of people who achieve their goals in 2019!